Back in the spring as the Panthers were rolling and playing their best hockey of the season, the Professional Hockey Writers Association alerted its chapter chairs that the nominations for the Bill Masterton Memorial Trophy, awarded to the player best showing perseverance, sportsmanship and dedication to hockey, were due soon. As the PHWA’s chair of our Panthers chapter, I was tasked with writing the nomination. Fellow chapter-mate Matthew DeFranks and I decided on nominating goalie Roberto Luongo, who had battled and overcome injuries and delivered the night of the Capitals game when he gave an incredibly emotional speech to a grieving community that needed a boost from one of its residents. The Florida Chapter of the PHWA is proud to nominate Roberto Luongo for the Bill Masterton Memorial Trophy for the 2017-18 season. The 38-year-old goaltender had hip surgery following the 2015-16 campaign, missed the last month of 2016-17 and battled through hand and groin injuries this year. 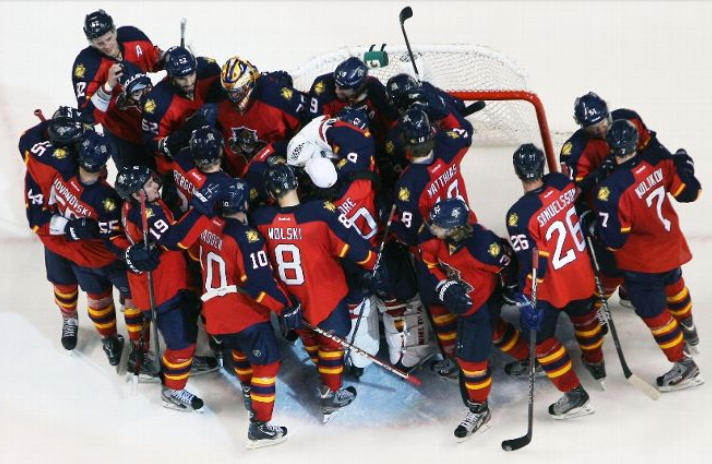 Luongo was injured last Dec. 4 against the New York Islanders, but his hard work and perseverance had him back in the lineup 26 games later on Feb. 17, helping the Panthers beat Calgary 6-3 and igniting a serious run for Florida as a contender in the Eastern Conference wild card race. In a 13-game span after his return, Luongo was 9-3-1 with a 2.44 goals against average and .928 save percentage, including a stretch of five consecutive wins from Feb. 22 to March 4. The strong performance helped the Panthers climb from the bottom of the conference standings into contention for a wild card spot and their first postseason berth in two years. A Montreal native, Luongo recorded the 76th shutout of his career by beating the Canadiens in Québec on Mar. 19 in a 2-0 win. The shutout tied him for ninth on the NHL’s all-time list with Ed Belfour and Tony Esposito, and was his second shutout of Montreal in less than two weeks. Luongo also ranks third all-time in NHL games played and is fourth in wins. He holds the Panthers’ franchise record for games played, wins and shutouts. A 12-year resident of nearby Parkland, Fla., Luongo gave an impassioned, unscripted speech regarding the Marjory Stoneman Douglas High School shooting in Parkland before the Washington game on Feb. 22. The match was the first at home since the tragedy for the Panthers, who had returned home after a five-game Canadian road trip. Just before puck drop, Luongo, dressed to play as Florida’s starting goalie against the Capitals, skated out and delivered a three-minute message to cap the organization’s emotional pre-game ceremony to honor the victims. He acknowledged the heroes at the school who protected the students and implored the South Florida community to join together, take action and heal as one in the wake of the shooting that claimed 17 lives eight days earlier, as fans and players were overcome with emotion. This entry was posted in Uncategorized and tagged Florida Panthers, Masterton Trophy, NHL Awards, PHWA, Roberto Luongo. Bookmark the permalink.